Thank you for visiting our web site! Bob is a world renowned diorama builder, founder and former president of VLS Corporation and all it's production companies. After modeling all his life as a hobby, his professional model career took off like a rocket in July of 1982. Bob entered a diorama titled "The Winds of War" in an IPMS National Convention in St. Louis. The subsequent recognition inspired him to continue in military modeling and competition. Throughout the following 2 years he won hundreds of awards in the U.S. and Europe. Articles in magazines from America, Japan, China, Germany, Italy and England brought expanded notoriety, and he decided to use the recognition to start up a business. With only $90 in start up capital, and working part time from home, Bob quickly grew the business into a multi-million dollar, multi-national corporation. By 1987, annual sales were topping $1 million. The VLS Corp achieved many other significant accomplishments over the years, and eventually became one of the world's most well known and appreciated scale model manufacturers, distributors and retailers. In January of 2007, Bob decided it was time to retire from the business side of the model industry. Presented with an attractive buy-out offer from MMD/Squadron, now the oldest and largest scale model mail order firm in the country, Bob sold the company. He continues to enjoy the hobby of scale modeling and is recognized for his fine contributions to the industry. For a complete bio, see the Bob's story link. 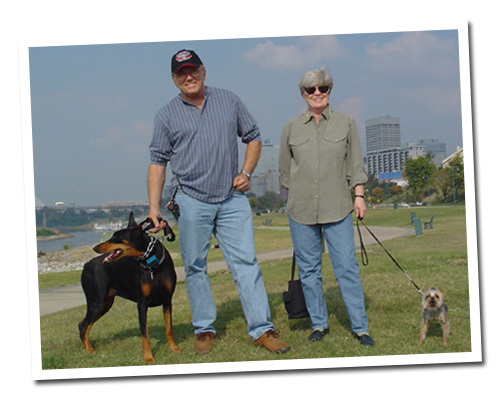 Bob Letterman and his wife, Susan Letterman, with their two dogs.